Ndea is a fruit from Africa. It occurs naturally in swamps and wet areas of northwest Congo and it is basically a tree of swamps. This fruit is believed to be a native of Africa only. 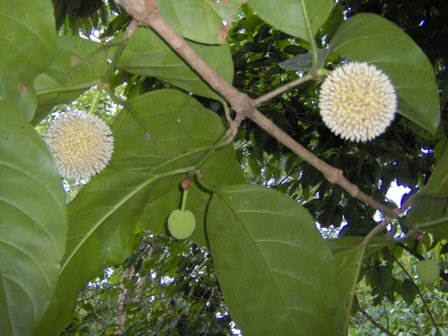 A medium sized swamp tree with a broad, rounded crown, mostly 10-15 m tall but can sometimes be as tall as 30 m.
Leaves oblanceolate, 40 cm, long with a pronounced leaf bract, especially when the tree is young; in opposite pairs and perpendicular to the previous pair. Flowers start out as hard little green balls at young leaf nodes towards the end of branches. The green balls then become fuzzy in appearance as hundreds of miniature white flowers emerge and bloom. 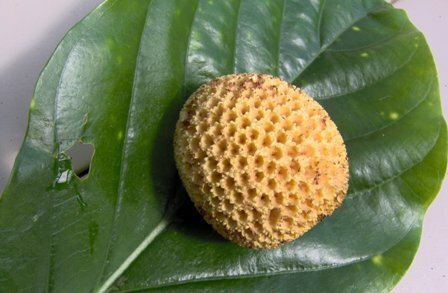 Ripe fruit looks like the pin-cushion; 5-10 cm wide; yellow at maturity, pulp white, edible, sweet. Seeds numerous, brown, tiny in size and arranged in rings like those of kiwifruit. Fruits are eaten fresh by people. These are tasty as well as filling. The fruits taste like apples but the texture of pulp resembles that of pears. Ndea seems have high sub-surface moisture. The plant is not even affected by water logging. This fruit will therefore not suit for arid areas. The trees can survive short bursts of freezing temperatures, but generally need a warm climate to flourish. Propagation is by seed. As the seeds are very small so these germinate like grass and require thinning. The seeds do not have very long viability. The seedlings grow quite fast. These start bearing after 4-5 years. No vegetative method seems to have been tried yet. Ndea is not cultivated on orchard scale yet. However the trees are planted in home gardens.